The four pillars. Courtesy of University of Lethbridge. The University of Lethbridge is getting back to its roots with the launch of its School of Liberal Education this summer. The school is the product of four years’ work by the liberal education revitalization team. Led by Dr. Wismath, the team clarified the university’s mission and expanded the liberal education program beyond its home in the arts and science faculty. 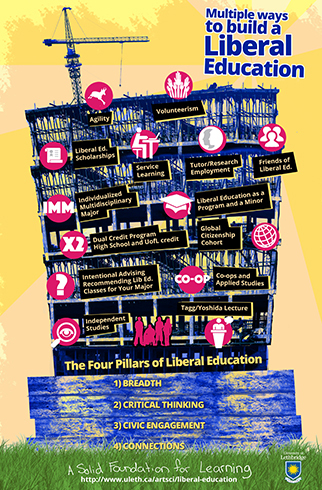 They decided on a “four-pillar” model prioritizing breadth, cross-discipline connections, critical thinking and civic engagement. “We have complex problems ahead of us in the world and we want our students to be equipped to solve them for the public good,” she says. 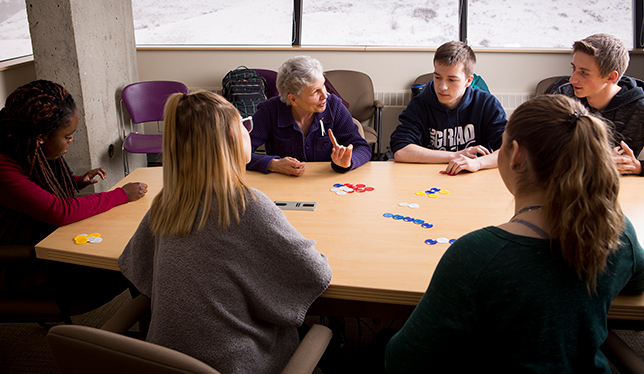 Dr. Shelley Wismath, centre, discusses a problem-solving exercise with students as part of a Liberal Education class. Photo courtesy of the University of Lethbridge.